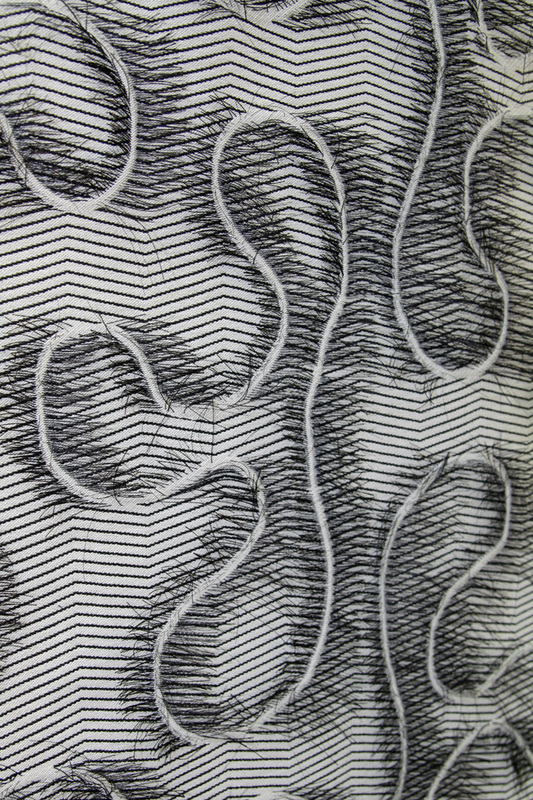 Jacquard woven silk and wool. 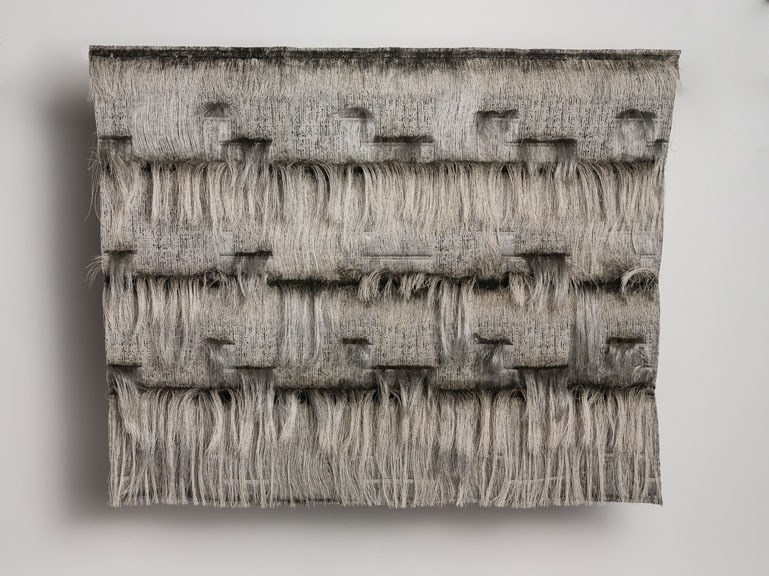 Jacquard woven, cut and manipulated, wool, linen, rayon and metallic thread. The title of this piece is from a novel by Jack Kerouac, about Lowell, Massachusetts and the scenes and sensations of his childhood there and his brother. I was trying to capture the slants of the roofs of the mills, the fog, the mist, the smoke Kerouac describes, as well as visiting and experiencing Lowell myself, trying to capture a low level of light. The novel is both beautiful and unsettling. So the angle in my piece is critical to the work. 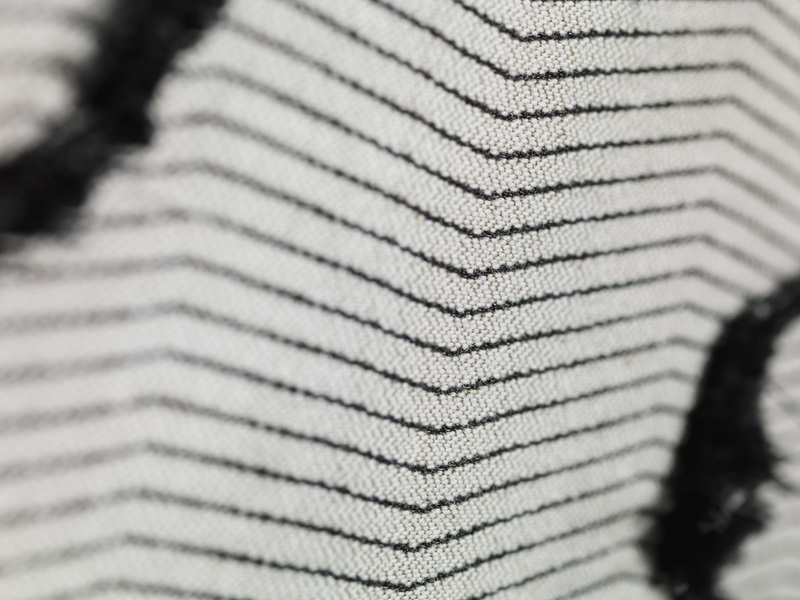 Using Digital weaving allowed me to create a slow angle, with a repeat of 180 inches. The cutting of the floats adds to the veiling or mist. 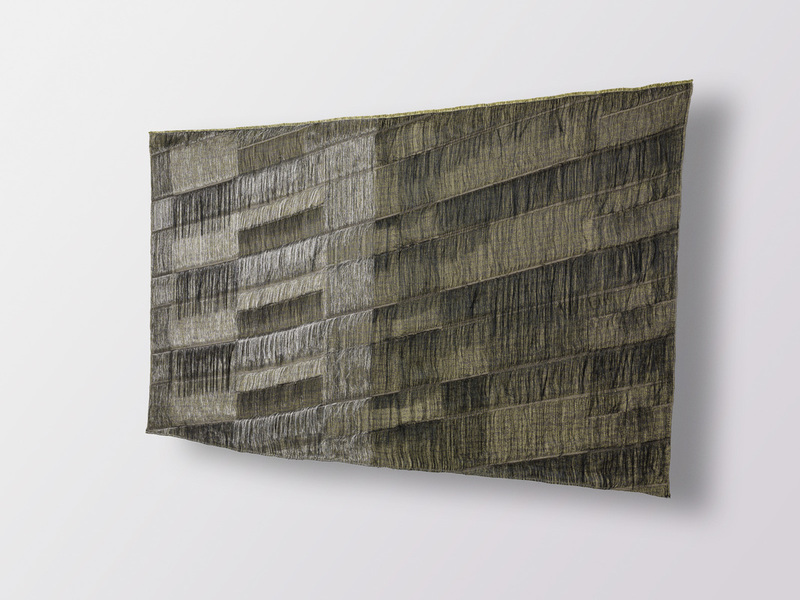 In many of my digital weavings the cloth is designed to be cut and manipulated. My pieces are designed with unlimited size dimensions. So a piece like Visions of Gerard can be woven the length of an industrial warp, because the piece is cut after weaving, there are almost unlimited possibilities for width and variety in surface. 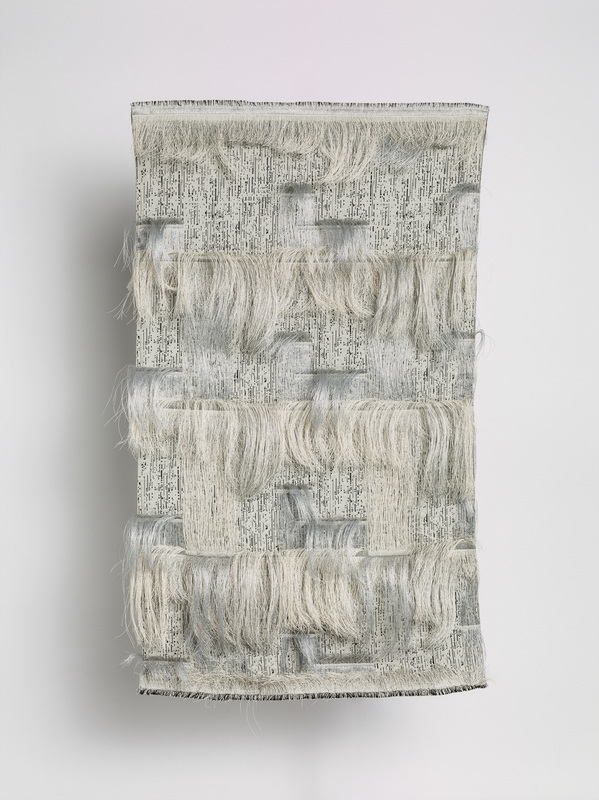 Jacquard woven, cut and manipulated, wool, recycled polyester, linen, polylactic acid fiber, nylon. 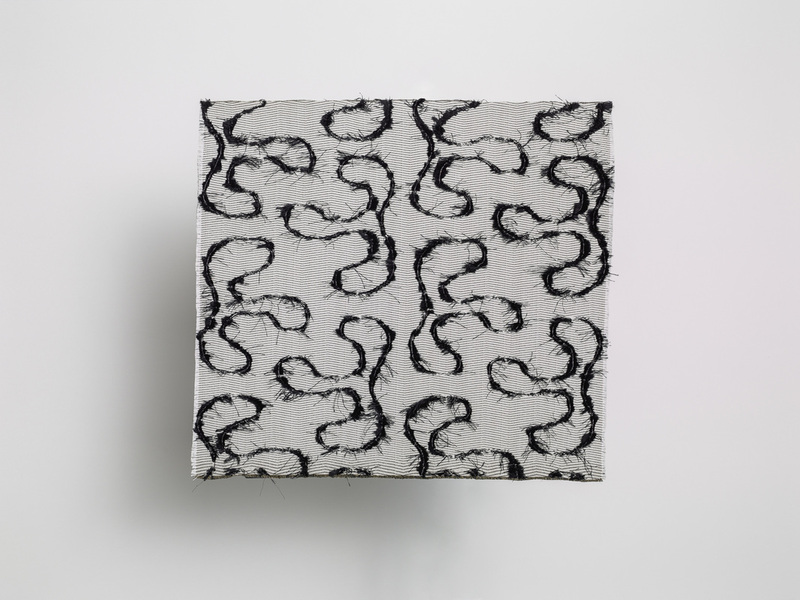 The second series of Jacquard cloths,called “Sickle and Sowed,” are the first cloths where the technique of cut floats was employed. The Van Gogh drawings I saw at the Kroller–Muller Museum in the Netherlands informed my own drawings that became the source for the cloths. The first cloth has been clipped and shorn as if the growth of threads is a weed like substance, unwanted, pulled and haphazard. The second cloth has been cut with more care. 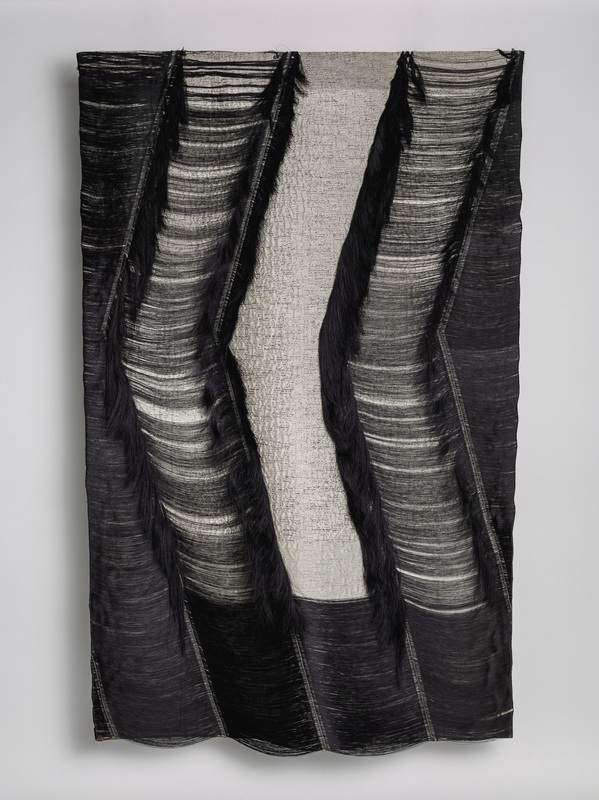 The cloth woven with linen, nylon and fine black metallic yarns synthesizes into a strange garden of threads that seem to have been grown from the surface. Below- hand cutting of Sow. 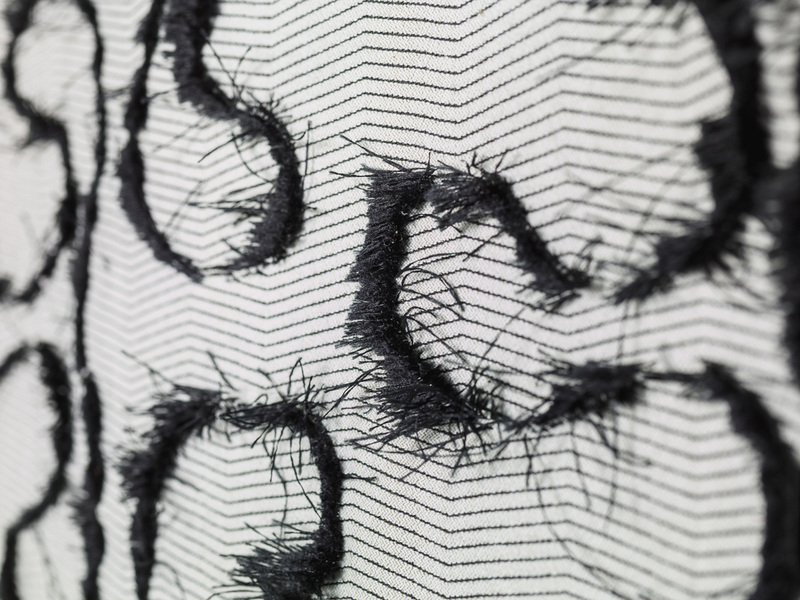 Jacquard woven, cut and manipulated, recycled vinyl coated polyester, wool, linen and cotton. The discovery of Swan Point Cemetery’s refined grounds and its surrounding mess of thickets is the visual reference for the piece. Unlike Graceland Cemetery in Chicago, which is surrounded by the city, Swan Point Cemetery invites discovery from the outside, while peering into its timeless suspended interior from the vantage point of an outsider caged in the thickets of the present. 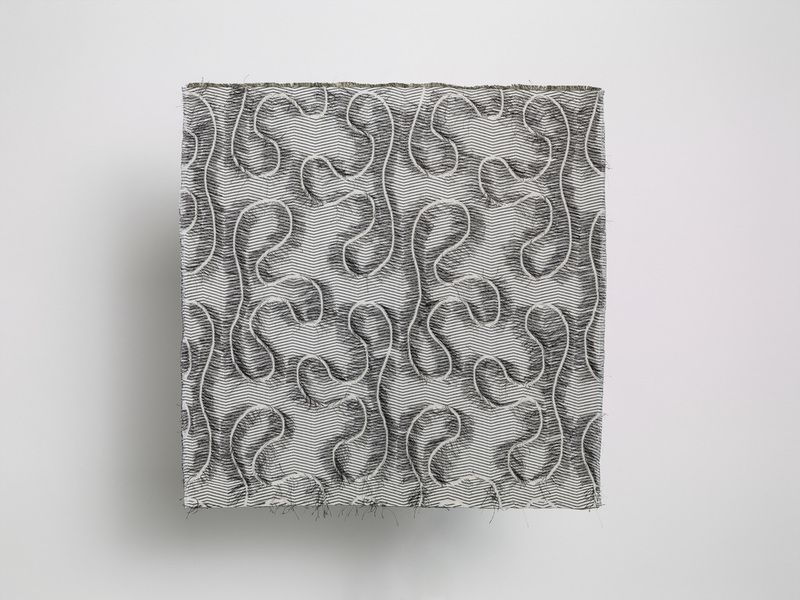 The yarn used for “Swan Point” is vinyl coated polyester, which has a stiffness that allows the cut floats to protrude with branch-like quality. 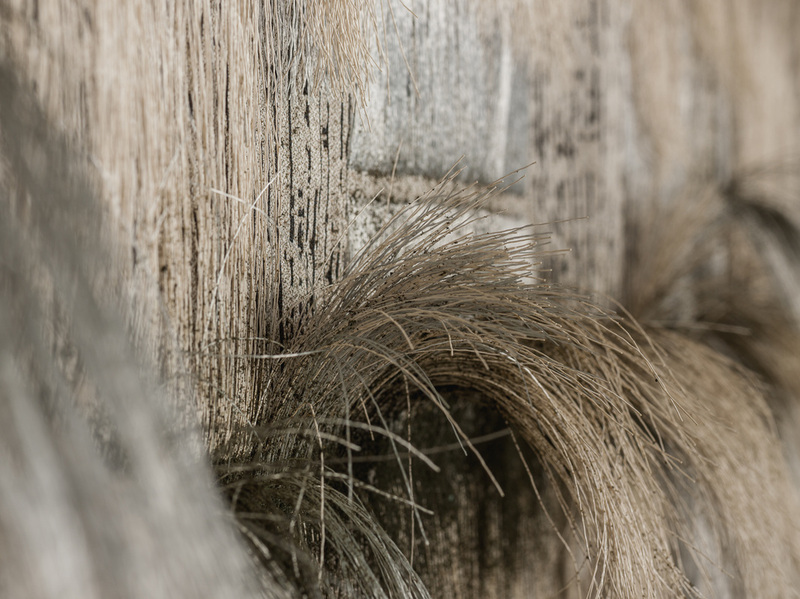 The piece hovers above the viewer, almost ten feet, while inviting inspection into its flowing structure. Veiling is achieved by the overlapping cut threads. The title of this piece and inspiration is from a novel by Yasunari Kawabata, Snow Country. I wanted to create a piece that mimics the transformation of the central character in the novel. The textiles transformation come from three changes; yarn color, material and hanging direction. the woven structure is identical in both of the iterations.